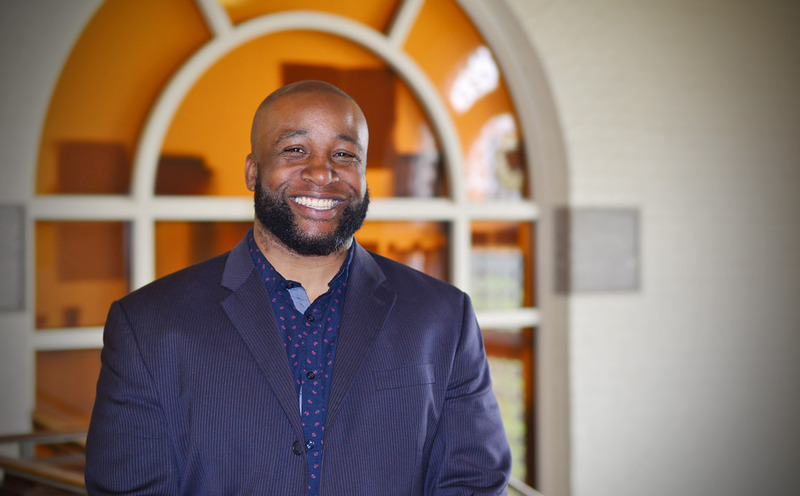 In this Q&A, we speak to Clifton Watson, who joined Wesleyan as director of the Jewett Center for Community Partnerships (JCCP) in February. A New Haven, Conn., native, Watson holds a BA from the University of Connecticut in African American studies, an MA from North Carolina Central in history, and a doctorate from Fordham in history. His dissertation explores the northern migration of African Americans who settled in the Newhallville area of New Haven—which is where he grew up. Q: Please tell us a bit about your background . 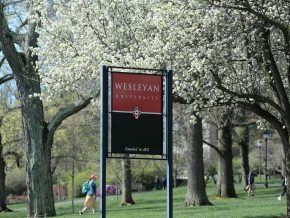 . . what drew you to Wesleyan? How did you know this was the place for you? A: I credit my career to an experience I had during the summer before my freshman year in college. I responded to an ad to be a summer camp counselor in New Haven (which is where I grew up). 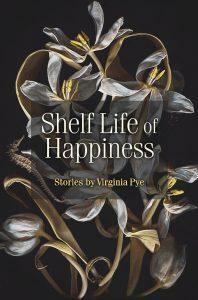 My primary interest was in earning some money to offset some of my college expenses. I envisioned facilitating recreational activities and leading field trips. 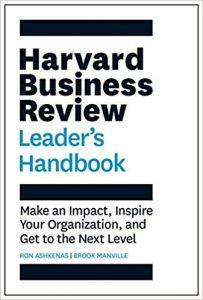 However—unbeknownst to me—I had applied to become a staff member of LEAP (Leadership, Education, and Athletics in Partnership). The organization, which was in its inaugural year—was committed to supporting the academic and leadership development of young people from some of the city’s most impoverished neighborhoods. This was not your typical summer camp—in fact it was a program, with a summer component. The organizers had been very thoughtful and strategic in the development of its program design and the stakeholders recruited to support their work. 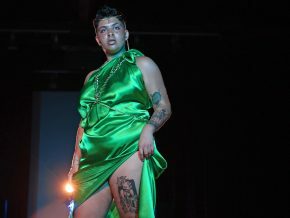 The program was the brainchild of a Yale undergrad and law student—and supported by Dwight Hall (the JCCP’s institutional counterpart at Yale). This program created a “community” of diverse stakeholders united by their interest in improving outcomes for youth and city residents. This jumpstarted my interest in leadership development and civic engagement and remains a shining example of a university-led—but cocreated with the community and mutually beneficial—project. I was drawn to Wesleyan’s Jewett Center for Community Partnerships because each one of its projects has the same transformative potential I saw in the LEAP experience. A: I am most excited about further harnessing student enthusiasm and willingness to engage with the greater Middletown community—while ensuring that the center continues to be supportive of student leaders (in both their professional and leadership development) and that the JCCP projects are effectively responsive to community needs. As I have recently moved to the area (Meriden), I am super excited about contributing to the civic fauna of my own community. 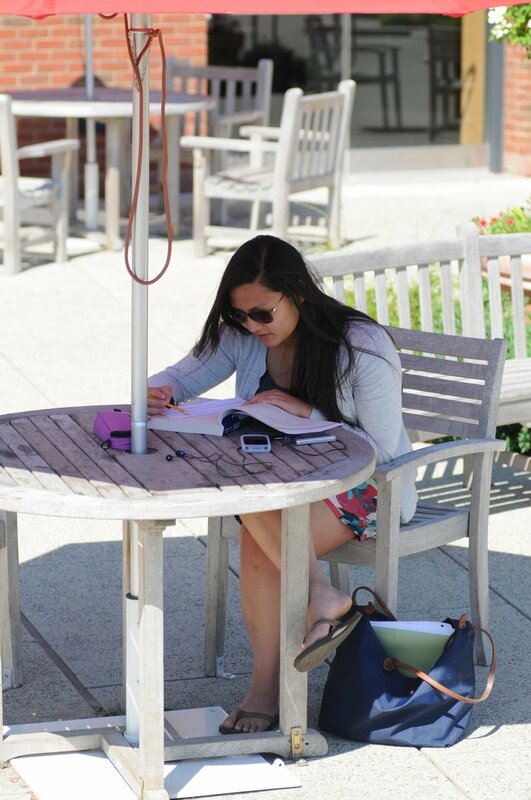 Q: What has been the biggest surprise in your time with Wesleyan? 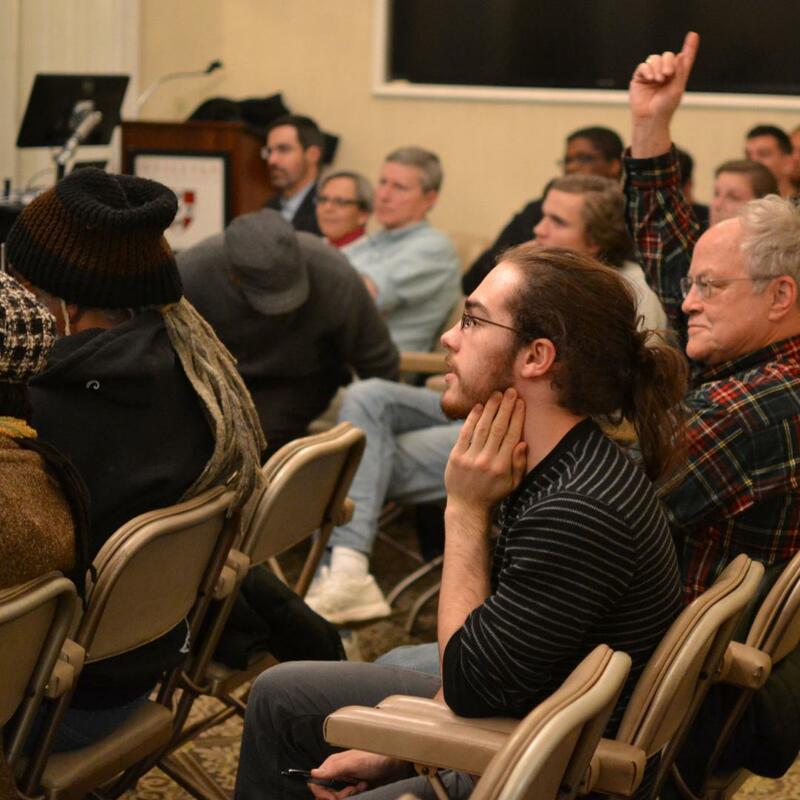 A: Wesleyan students have a reputation (which stretches far) for being enthusiastically committed to civic engagement. This was on full display as soon as I arrived on campus. I was struck by the number of students who emailed, called, and dropped by to greet me and ask questions about my plans for the Jewett Center or discuss an idea for a program or event. In fact, the week before I officially started, I came to campus to briefly meet with Marc Eisner [Dean of Social Sciences and Henry Merritt Wriston Chair of Public Policy]. When Marc walked me over to Allbritton Hall to show me my office space, I was met by a student reporter from the Argus, who somehow learned I was on campus! She wanted to interview me and discuss my vision for the JCCP. 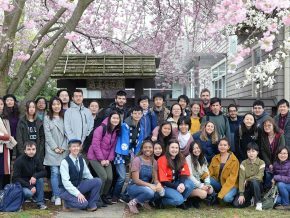 Overall, I’ve been surprised by the pure number of projects being led by Wesleyan students and thoughtfulness with which they approach their work. Q: And what are your hobbies? What do you do in your time off? A: Over the past three years, I’ve really gotten into gardening. I can’t say that I have a green thumb—but I’ve had a ball learning through trial and error. I’m committed to having a solid sweet potato crop! Gardening is one of those things my grandparents and parents were into and encouraged me to learn about, but I just couldn’t get into when I was younger. Years later, I’m begging for advice! In some ways, I am “late to the party,” but glad I finally decided to take an interest. Q.: What is your favorite book? A: My favorite book is All God’s Dangers: The Life of Nate Shaw, by Theodore Rosengarten. All God’s Dangers is the autobiography of a black tenant farmer from east-central Alabama, who came of age in a society of former slaves and slaveholders. This is the narrative of a common man moved to confront the injustices that limited his economic and political freedoms. Through the book, he recounts dealings with landlords, bankers, fertilizer agents, mule traders, gin operators, sheriffs, and judges—detailing stories of the social relations of the cotton system, while offering his rationale for joining a tenant farmers union in the early 1930s. 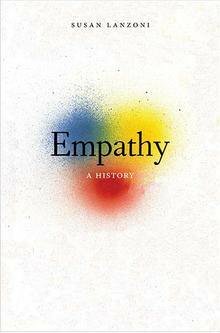 I’ve found this to be a compelling narrative about an “everyday person” who first developed an analysis of a pretty complicated economic and political system, then moved into action to confront it—despite the certainty that his efforts would be met with brutal violence. This has always been a favorite of mine because it recognizes the enduring and complex—though infrequently highlighted—resistance culture and organizing tradition which undergirds the black experience in America. On Dec. 19, Wesleyan President Michael Roth signed an MOU with Beth Hamilton, at left, representing CONNSACS and Carissa Conway, at right, representing Women and Family Services (WFS) of Middletown. Wesleyan seeks to strengthen sexual assault prevention and response programs by developing partnerships with local community resources. 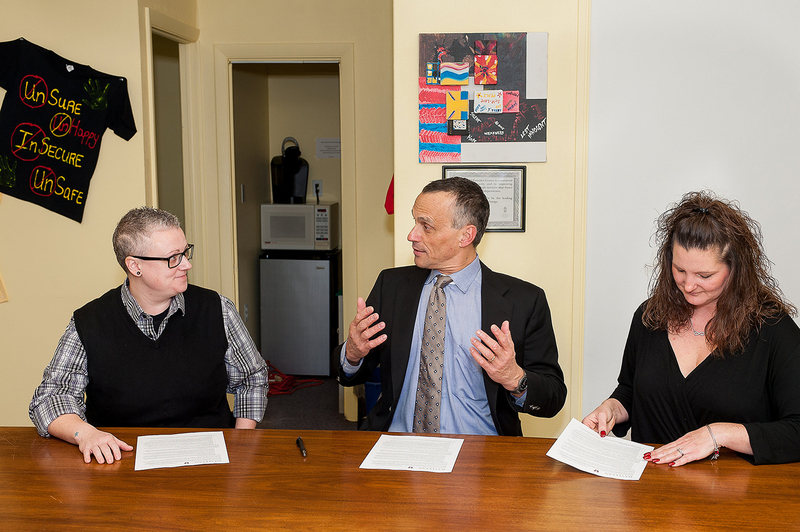 On Dec. 19, President Michael Roth formalized a partnership with the Women and Families Center of Middletown (WFC) and Connecticut Sexual Assault Crisis Services, Inc (CONNSACS) through the signing of a Memorandum of Understanding (MOU). This MOU formalizes the commitment of all three agencies to work together to provide trauma-informed services to student and employee victims of sexual assault and to improve the overall response to sexual assault at Wesleyan and within the greater Middletown community. The publicity campaign, “Did You Know” highlights little-known facts about community engagement. 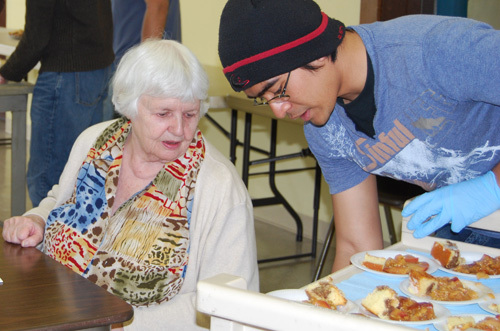 You’d be surprised by what people don’t know about Wesleyan’s community engagement and service programs. Or, what people think they know. 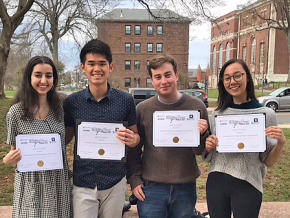 “Students and others think that community service at Wesleyan is an individual, versus a university effort, or just one semester for one student, on their own,” said Cathy Lechowicz, director of the Center for Community Partnerships. A new publicity campaign launched by the CCP last month aims to fix those misimpressions. 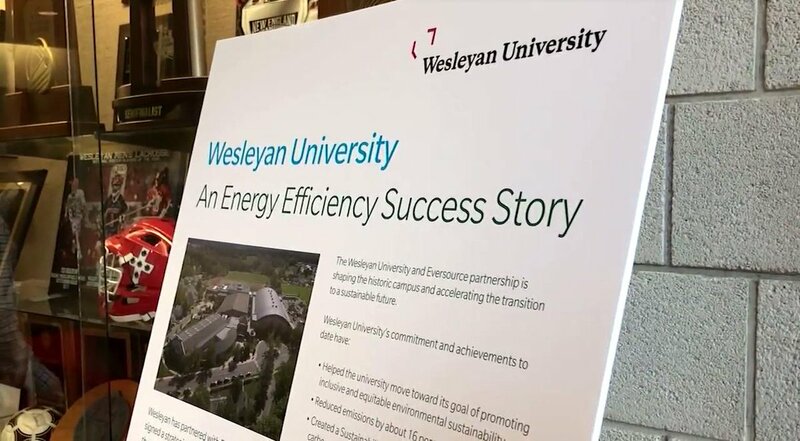 The reality is that Wesleyan has a broad community engagement plan that ranges from hiring local contractors and sourcing local food to providing volunteers to Middletown service agencies, Lechowicz said. The publicity campaign, “Did You Know” highlights little-known facts about community engagement twice a week on WesLive Community Blog, the Middletown Eye and social media. “Like” the CCP’s Facebook site online here. Dana Pellegrino ’12, who is spending the year as the CCP’s civic engagement fellow, hopes the campaign will draw attention not only to how Wesleyan students can participate in service projects, but to “the larger community engagement piece,” and how Wes interacts with the Middletown residents, businesses and agencies. *The Wesleyan Quantitative Analysis Center offers a course in which students provide free statistical consulting to local community service agencies. 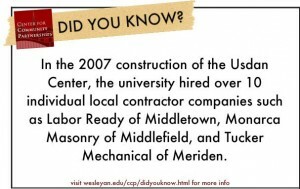 *During the 2007 construction of the Usdan Center, the university hired more than 10 local labor companies. *The Fast-a-Thon, an annual student run benefit, has raised more than $50,000 over the past five years to benefit Amazing Graze Food Pantry. Nearly half the student body participates. Combining the assets of the Service-Learning Center, the Office of Community Service and Volunteerism, the Office of Community Relations and the Green Street Arts Center, the CCP seeks to serve the development of both the individual and the community, guided by principles of mutual respect and shared responsibility. See the CCP’s website for more information. 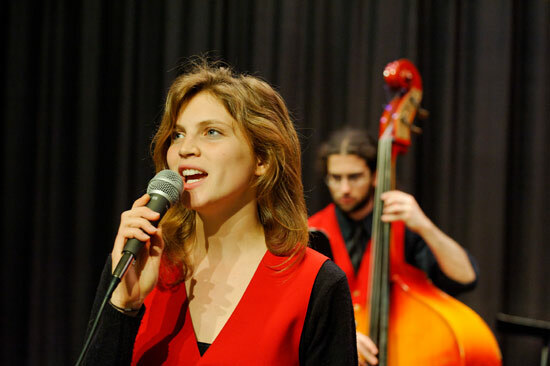 Elizabeth Gauvey-Kern '11, a music and government double major, sings Duke Ellington's "It don't mean a thing (if it ain't got that swing)" during a Wesleyan Jazz Orchestra performance April 30 at Woodrow Wilson Middle School in Middletown. 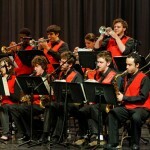 Wesleyan jazz musicians have been tooting their own horns to the local community. 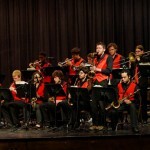 During spring semester, the 20-member band has performed six times at public elementary, middle and high schools in Middletown. 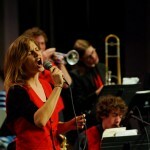 They work under the direction of vibraphonist-composer Jay Hoggard, adjunct associate professor of music. 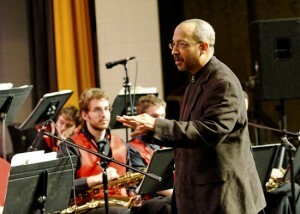 Jay Hoggard directs the Wesleyan jazz orchestra at Woodrow Wilson Middle School. 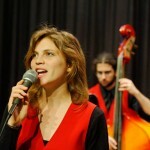 The orchestra’s 2009 repertoire consists of music by Duke Ellington, Thelonious Monk, Thad Jones, Charles Mingus, Sonny Rollins and Jelly Roll Morton. The group spends the fall semester listening and learning music, and performs select pieces at the schools during the spring semester. The Wesleyan students dress to impress. On stage, they don black pants, shirts and a Cardinal red vest. The concerts themselves lasted for about 50 minutes. If time allowed, Hoggard also introduced the Wesleyan musicians and their instruments, which ranged from clarinet to trumpet to piano. 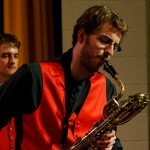 Baritone saxophonist Bob Gambo ’10 played for a large jazz orchestra in high school and joined the Wesleyan orchestra to continue his musical education, and gain a deeper understanding of jazz music. The students travel to the schools in their own vehicles, or a Wesleyan passenger van. They leave campus around 12:20 p.m. and return by 2:30 p.m. 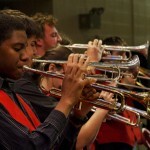 But it’s the getting there – and getting back – that teaches the Wesleyan students the most about life as a musician. Hoggard says the prep and take-down account for more than 50 percent of the time at the schools. The young musicians are given a sample of the touring life in a way that few of them have ever experienced. 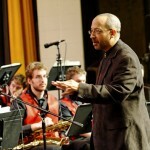 This is Hoggard’s 17th year directing the Wesleyan Jazz Orchestra at local schools. He started the program in 1992, when his own children were enrolled in the Middletown Public School system. He’s maintained the connection with the schools ever since. In Spring 2009, Hoggard directed the Jazz Orchestra at, Keigwin Middle School, Wesley Elementary School, Moody School, Middletown High School and Woodrow Wilson Middle School. Photos of the orchestra below by Bill Burkhart. The Carnegie Foundation for the Advancement of Teaching recently recognized Wesleyan for its continued involvement in community outreach by selecting the university as a recipient of a 2008 Community Engagement Classification. The university was among 119 institutions (and among two in Connecticut) that received this classification for 2008. The foundation initiated the community engagement classification in 2006. Visit this page for more information and a list of the selected institutions. The Center for Community Partnerships (CCP) hosted a "Green Your Holiday" craft event Dec. 6 for the Wesleyan staff, faculty and students and the local community. 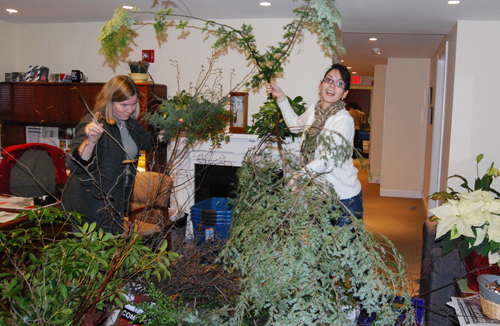 Volunteer Sheila Graham Smith, at left, taught participants how to make festive centerpieces using fresh pine greens. Elisa Del Valle, assistant director of student activities and leadership development, is pictured at right.